Can you believe Christmas is in a few weeks? I have had a hard time believing it, we haven't had a sighting of snow yet! Last year at this time, we were knee deep in snow. It's barely been below freezing! It's funny how one winter can be completely different from the next. Despite the unseasonal temperatures, I have still found the Christmas spirit. We got our tree up early this week and I put up lights last week. And we have been enjoying holiday treats to the max. I love this time of year! And, I have managed to finish all of my christmas shopping as well. That is always a nice feeling! So, on to this absolutely amazing cake. I mean seriously, it is heavenly. Let me break it down for you. First, I made pastry cream tinted with almond extract. Then, I made a fluffy, white cake. Then, the cakes are sliced in half, and pastry cream is slathered in between the layers. Then, the cake is towered up high. Pastry cream is folded into whipped butter, tinted with amaretto, then spread over the top and sides of the cake. Lastly, almonds toasted to brown perfection are pressed into the frosting. Ta da! Yes, there are several steps to this cake, but it is SO worth it. This cake is one of those showstopper desserts that would 'wow' everyone. To make the pastry cream, pour the milk into a small saucepan and bring to a boil over medium-low heat. In a separate heavy-bottomed saucepan, whisk together the egg yolks, sugar and cornstarch until well combined. Very slowly, whisk in about 1/4 cup of the hot milk into the eggs to temper the eggs so they won’t curdle. Whisk in the remaining milk. Place the saucepan over medium heat and whisking constantly, bring the mixture to a boil. Cook, whisking constantly, for 1-2 minutes or until the mixture is thick and the whisk leaves streaks through it. Remove from the heat. Whisk in the vanilla extract and almond extract, then let sit for 5 minutes. Whisk in a few pieces of butter at a time until fully incorporated. For the cake, preheat the oven to 350ºF. Grease and flour two 9-inch cake pans, knocking out excess flour. Making sure you grease the pans really well. In the bowl of your electric mixer, beat the eggs until light and light colored. Add sugar and continue beating until fluffy, about 3 minutes. In a separate bowl, mix together the flour, baking powder and salt. On low speed, slowly add the flour to the egg and sugar mixture and beat until smooth. In a small saucepan, heat the milk and butter, bringing it almost to a boil, stirring all the while. Beat the milk into the batter. Stir in the vanilla. Pour into greased cake pans, and bake for 20-25 minutes, or until a toothpick inserted in the center comes out clean. Let cakes cool for 10-15 minutes then turn them out of the pan onto a cooling rack. Cool completely before assembling. For the almonds, line a rimmed baking sheet with parchment paper or wax paper and set aside. In a large skillet, melt the 1 tablespoon butter. Stir in the almonds and cook until golden brown, about 5-8 minutes, stirring often. Stir in the granulated sugar and continue to cook until caramelized the nuts are a deep golden brown, another 3 minutes. Transfer the nuts to the prepared baking sheet and spread into an even layer. Let cool completely before using. For the frosting, transfer 1 cup of the pastry cream into a small bowl and let come to room temperature. In the bowl of a stand mixer fitted with the paddle attachment, beat the butter until smooth and light, about 3 minutes. Mix in the pastry cream in three separate additions, beating well after each addition. Mix in the amaretto and a splash of heavy cream, and continue to beat until light and fluffy, 3-5 minutes longer. Set aside until ready to use. For the filling, fold the whipped cream and almond extract into the remaining pastry cream. To assemble the cake, slice the two cake rounds in half horizontally. Spread filling over the cake layers, excluding the very top layer. Stack the cakes one on top of each other. Spread frosting in an even layer over the top and sides of the cake. 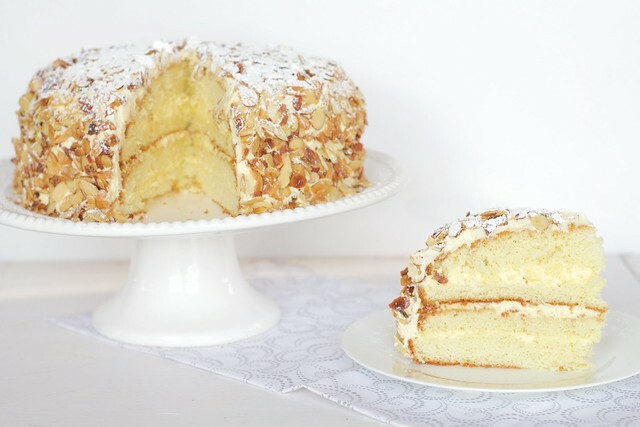 Gently press the toasted almonds into the frosting all over the cake. 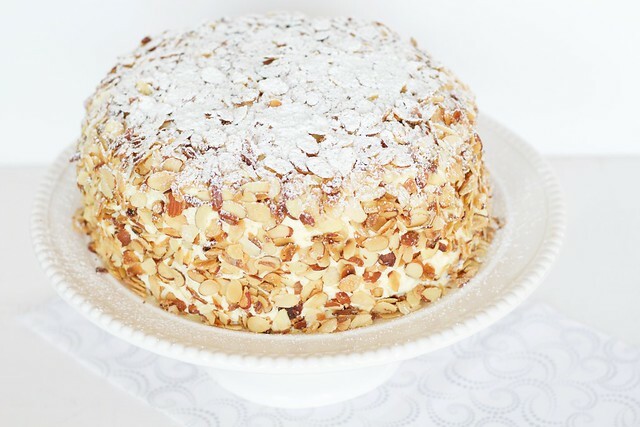 Dust the top of the cake with confectioners' sugar and serve. * I made the pastry cream and cake the day before. I just wrapped the cake rounds in plastic wrap and placed in the refrigerator. Allow to come to room temperature before assembling.